If we want to protect our properties and keep our homes safe then we all need to take precautions, but that doesn’t mean you have to go out and spend thousands on fancy house security systems! But how can we protect our homes and keep them safe if we simply have no room in our budgets? There are a few easy and cheap ways to do this. 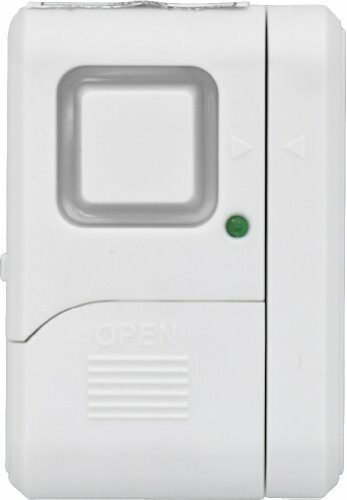 Many people think just because they pay for an alarm service that they don’t have to worry anymore, but thieves can be devious and many times they will find the easiest route in. An acquaintance that lives a few streets over had his house all wired up and simply did not worry about a break in. But it did happen. He had a garage door opener in his minivan that bypassed the security system. His front doors were steel and bolted his patio doors had extra security on them, he always remembered to arm the system, but all he did one day was forget to lock his van. Thieves probably started out simply looking for loose change (which they did find) and they took a few things from the van, but then quickly discovered the big button on the visor. They pushed it and the big garage door opened like a welcoming committee. They found their way inside and because they were most likely on foot wanted things they could grab quickly, so they didn’t take anything from the garage but got into the main house through the inner door. Grabbed some money, camera equipment and made a mess then simply opened the back door and left. It was not until they left the back door that the alarm was triggered, but by then they were gone. So even if you can afford a brilliant security system, you still need to take some precautions to keep you and your property safe. Tip 1 – Get to know your neighbours. You don’t need to be best buddies, but let them know when you will be away or who lives in your house and this way they will tweak to something going on that was not right. In this case, a neighbour saw them casually opening the van door and going in the garage, but because he had never met the homeowners he thought they lived there as they did this in broad daylight and looked quite at ease. Tip 2 – Lock your Car Doors – Don’t keep anything valuable in site. Put away that GPS you have on your dashboard and don’t accumulate loose change in plain sight. They take a quick look in the car and then try the handle if they think there is something worthwhile. In the above case cops figured they were just looking for loose change and some CDs put hit the jackpot when the door opener was discovered on the visor. Tip 3 – Motion Sensor Lights – You can get little sensors that can be added to the lights you already own so that you don’t need to replace them. They are sold at most home improvement stores for under 20 dollars. We did this for an outside light we already own. Thieves do not like being lit up randomly especially in the backyard. 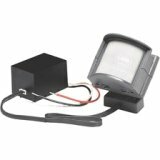 this adapter will make your present outdoor lights into motion sensor lights without having to replace your fixtures. doors as a main entry. This way you can lock them and then put the stop in place, and if you don’t have one, simply find an old hockey stick or broom stick and cut it to length so that it can be placed in the track to stop the sliding door from being slid open even if the lock is broken. Then head out a regular door and lock it behind you. Tip 5 – Don’t tweet to the entire world that you are going away. You just don’t know who is monitoring out on social media that would be alerted to the fact your house will be empty. Tip 6 – If you must leave some windows open for ventilation such as in the hot summer, then only open them far enough for venting and not for gaining access and then place a stopper so that window will not open any further. Depending on the style of your window you can create your own or get them quite cheap at home improvement stores. Tip 7 – Have a lock on your back gate – Many thieves will try to gain access through a not so easy to see backyard. Tip 8 – Frost the Side Window Lights – If your big main door just happens to have side windows and it is just too expensive to replace the door, then get a frosting kit or faux stained glass film from the hardware store and cover these. This way the light still gets in but thieves cannot get a perfect view of what you may have inside your house that will be worth breaking in for. Tip 9 – Put your ladder away. That is great that you just finished cleaning out the eaves trough or doing that painting or repairs, but leaving a ladder out in plain sight is like leaving an invite to the second storey windows. Make it difficult for them to attempt it. Tip 10 – Make sure your basement windows can lock – Many thieves will break in through unlocked basement windows or basement walkouts, or consider adding very affordable window alarms that will hopefully scare them off. You can get these online. Tip 11 – Don’t forget to make sure that pet door is locked too! That is great that Fido can come and go but if you have a big enough pet door it can be forced and entry gained. So, if you plan on installing one, spend a little more and get one with a good solid frame and able to lock. Nothing is fail proof but most thieves are opportunists and will look for easy ways in, so making it more difficult is the trick to DIY home security systems.